Usually targeted by enemy's Nuker. 1. Frost Arrow : Induces a freezing effect to the hero's attacks. Each attack slows the enemy's movement and attack rates. NB: Orb effect doesn't stuck. Right click to auto cast. 2.Silence : Stops all enemies in a target area from casting spells. NB: After 6.75 changelogs, this skill become Global Aura. More efficient. NB: For damage seeker, People take Stats on early, then they take frost arrow in level 12,13, 17, and 18. Pick Traxex if your team need Carry / you are pros in farming. Don't pick Traxex if your enemy have to many Gankers or Nuker / your team have to many agi hero. Traxex is flexible, you can go anywhere. Choose wisely, usually, i'll go solo or go with support type hero(At least, they have stun). In mid game, traxex usually still like chubby. it still cute and doesn't often killed enemy. Don't be so sad if your just got a few kill. Still focus on farming. Just Lothar / yasha doesn't give you much advantage to evolve into Beast ! farming until you got at least 2 Luxury Item. 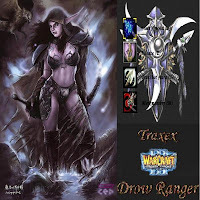 When on war or ganking, Traxex is easy to use. We just need to seek enemy with a lowest HP, silence him and if possible silence him with another, then hit him until die. That will become some of looping until your life in danger. The tips is just one. Try to stay on the fog in the war. This helping you to get less damage from nukers and to ease your escape.